Oil on wood, 43,5 × 62,5 cm. Bought in 2018. This acquisition was made possible thanks to a very sizeable donation from the Aage and Johanne Louis-Hansen Foundation, Augustinus Foundation and New Carlsberg Foundation in addition to funding from the wills of Director Per Vilhelm & Mygge Kolbing-Nielsen. 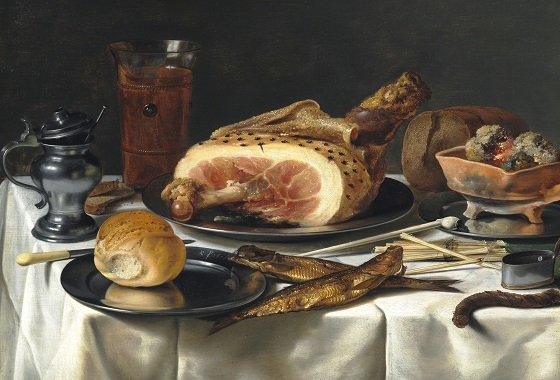 A cut clove-studded baked ham with its skin stripped back, dominates this painting. You can feel disgust or attraction to this somewhat macabre display of flesh and death, while at the same time admiring the formidable technical ability of the artist who painted it. The objects are so realistically depicted that you feel invited to take a seat. The painting is typical of Claesz’ earlier works in the mid-1620s. It is a masterful composition with strong contrasts between the white tablecloth and the pitch-black background, reconciled in the middle by the pinkish-red ham. The straw and smoked herring strewn horizontally across the table create a sense of depth and compositional balance. In this work, Claesz’s ambition appears to have been to explore the form, colour and texture of the different composition elements. One can clearly sense the distinctiveness of the fatty ham, the shiny herring, the warm coals, the matte tin and crusty bread. Claesz often recycled elements from his previous works. The little mustard jar can be found in several of his works, including his still life paintings in the David Collection, Copenhagen and Musée des Beaux-Arts, Paris. As was customary in the Baroque period, the painting contains several symbols which relate to the ephemeral nature of life, the so-called vanitas symbols. The seemingly arbitrary placement of food on the table leaves the spectator with an impression of a scene where someone has just recently walked away from their meal. Claesz thus manages to incorporate a sort of temporality into a static painting. At the same time, the slowly dying embers in the backdrop constitute a subtle yet unmistakable symbol of the transience of life. Both elements represent the passage of time, something which painters of that era felt was crucial to incorporate into their works. Claesz remained a genius without a name for close to three centuries. Experts were familiar with a group of still life paintings of an exceptionally high quality, all signed with the monogram “PC”, but no one knew who the painter could be. Accordingly, he was simply referred to as “Monogrammist PC” and “Master PC”. That is, until the Dutch art historian and curator at Mauritshuis Abraham Bredius identified the mysterious PC as Pieter Claesz in the late 1800s. Claesz was born in the Flemish town of Berchem, but moved to Haarlem soon after and quickly made a name for himself as the city’s best still life painter. European commerce was thriving in the early 1600s, which meant that artists’ clientele was no longer restricted to nobility and the king. Claesz was exceedingly popular among the Dutch merchants, who in the 1620s bought the paintings that would later be regarded as his finest work. As prosperity continued to rise and the merchant class continued to grow, demand for art rose sharply during the 1630s and 1640s. Claesz accordingly picked up the pace to meet the demand, painting roughly twice as many works during these decades as he had in the 1620s, which meant that his later works became less consistent in terms of quality.